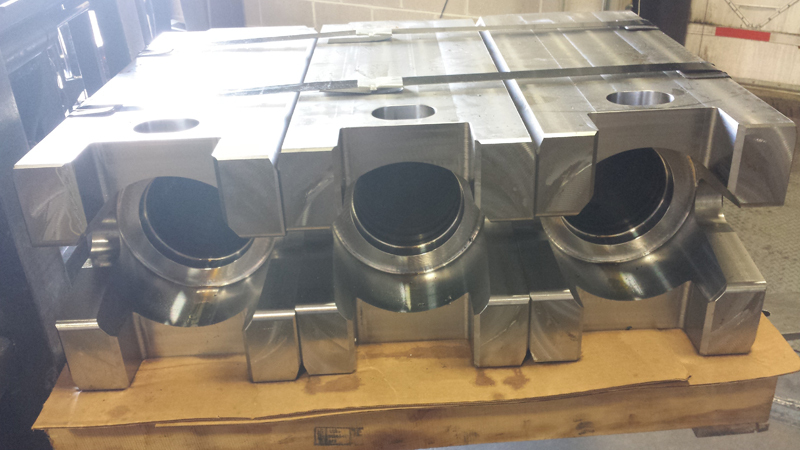 At Midwest Precision Manufacturing, we specialize in providing precision deep hole drilling for a number of challenging applications. The part shown here is a hydraulic spider riser that is used in the oil and gas industry. 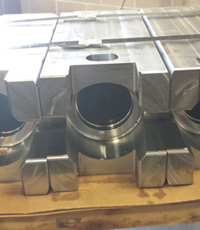 The part is machined from 4340 alloy steel and measures 11.750" in length, 11" in width, and 28.250" in height. This project presented a unique challenge due to the hole position relative to the other part features. The hole sets back from the face of the part, which required the fabrication of a custom fixture in order to maintain the necessary precision during the drilling process. We can work with customers to develop specific processes or tooling that solves complex manufacturing challenges. The 5.75" diameter center hole was drilled using a deep hole boring process while holding tolerances as tight as ±0.002" through the 28.25" part length. Ten of these risers were drilled with a total turnaround of one week. Many customers contact us requesting a quick turnaround and our team is very adept at meeting these requests. For additional details about this precision deep hole drilling project, see the table below, or contact us directly.